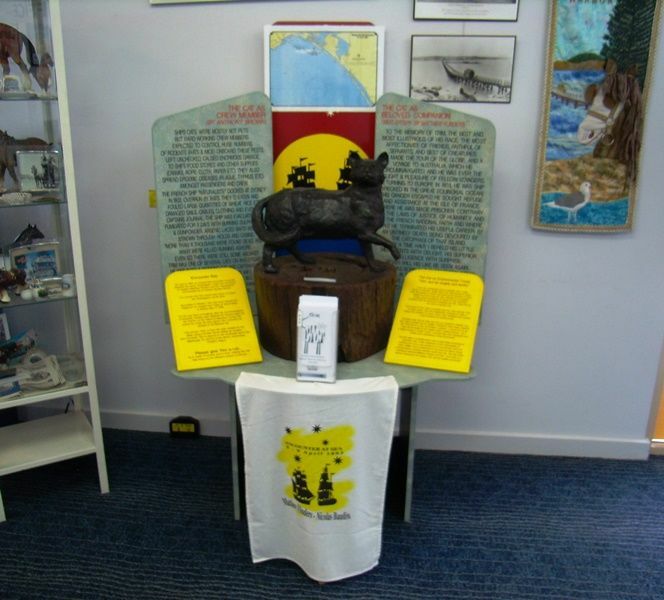 A bronze statue commemorates Matthew Flinders cat, Trim, and is a recognition of the Encounter meeting of 1802. Trim was made from the cast created for the State Library of New South Wales by sculptor, John Cornwell. In the immensity of ocean to the south of Terra Australis, two ships met by accident on 8 April 1802, one sailing from the east and the other from the west. Trim was born in 1799, aboard the ship HMS Reliance on a voyage from the Cape of Good Hope to Botany Bay. The kitten fell overboard, but managed to swim back to the vessel and climb aboard by scaling a rope; taking note of his strong survival instinct and intelligence, Flinders and the crew made him their favourite. 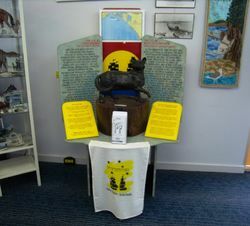 Trim sailed with Flinders on HMS Investigator on his voyage of circumnavigation around the Australian mainland, and survived the shipwreck of the Porpoise on Wreck Reef in 1803. When Flinders was accused of spying and imprisoned by the French in Mauritius on his return voyage to England Trim shared his captivity until his unexplained disappearance, which Flinders attributed to his being stolen and eaten by hungry slaves.